A growing number of adults are choosing ‘invisible’ orthodontics to straighten the overlapping, crooked or spaced teeth that have made them feel self-conscious about their smile since childhood. These revolutionary clear braces systems are designed with adults in mind, delivering amazing results while letting wearers carry on with their daily lives. At S10, we use the Invisalign system, which can transform your smile into the perfect smile without anyone even having to know that you’re having treatment. Invisalign uses clear positioners and other invisible appliances to gradually move your teeth into the required position. The positioners are made from wafer thin medical grade plastic, which makes them comfortable, easy to wear and practically invisible. If you decide Invisalign is the right option for you, our dentist will take impressions, x-rays and pictures of your teeth, which will be used to create bespoke positioners. These positioners are worn in a series of two-week periods, and can be used in conjunction with a number of other invisible orthodontic methods to get the best possible results. 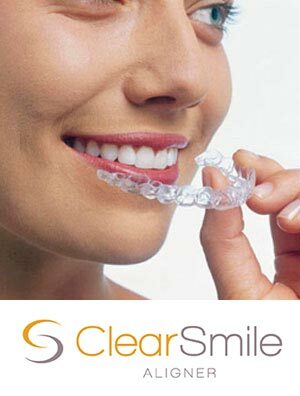 We also use the ClearSmile Aligner for those with milder orthodontic problems affecting the front 6-8 teeth. Like Invisalign, ClearSmile is a clear, removable orthodontic aligner series that uses impressions to straighten crooked, rotated or tilted teeth. ClearSmile braces are so comfortable and invisible that you’ll forget you’re even wearing them. As they are removable, you can eat, drink and brush your teeth without any inconvenience at all. If you’re happy to go ahead with ClearSmile braces, we will take impressions of your teeth and produce an Archwize simulation that will allow you to see the final results on a 3D model. This way, both you and the dentist can check the proposed outcome before treatment even starts and any necessary adjustments can be made. Once your aligners have been created, treatment can commence. We will monitor your treatment progress frequently and take new impressions every six aligners to make sure we meet your orthodontic goals. Why not book a free cosmetic assessment to discuss how you can transform your smile into a perfect smile with Invisalign or ClearSmile Aligner?